In Tucson's 'Silent Chaos,' Rare Medic Kits Were Key First responders at the Arizona shootings had an unusual tool: a fanny-pack-sized collection of first-aid materials based on gear used to save soldiers. The Infantry First Aid Kit includes $99 worth of items, including combat gauze, a tourniquet and an elaborate wrap originally called an "Israeli bandage." 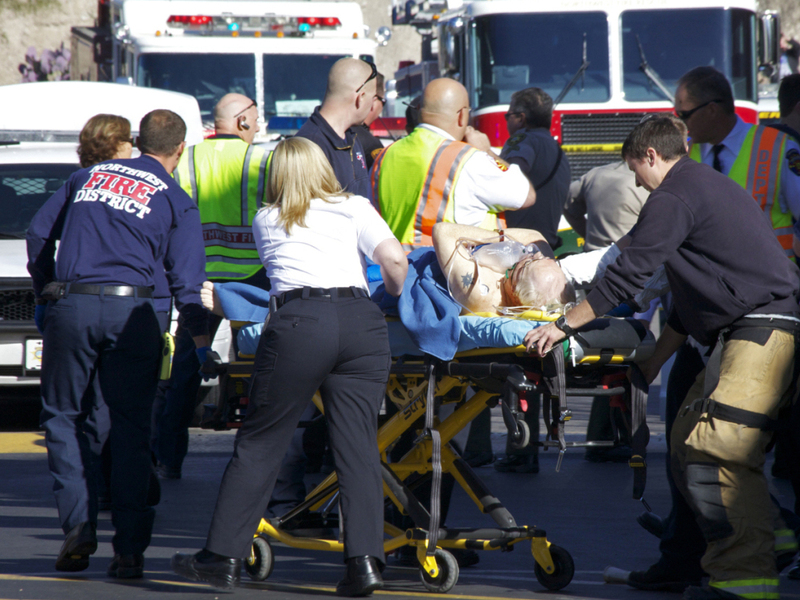 Emergency personnel attend to a shooting victim outside a Safeway in Tucson, Ariz. Rep. Gabrielle Giffords (D-AZ), and others were shot as the congresswoman was meeting with constituents. First responders to the scene used special first aid kits to help treat victims until medical personnel arrived. First responders at the Arizona shootings had an unusual tool: a fanny-pack-sized collection of first-aid materials based on gear used to save soldiers on the battlefield. And it allowed Pima County sheriff's deputies to begin treating the wounded in the crucial minutes before paramedics arrived. That morning, Deputy Gilbert Caudillo was patrolling northwest Tucson when he got a radio call about multiple gunshot victims at a local Safeway store. He was one of the first to arrive, jumping out of his car and running across the parking lot. "I didn't hear anybody screaming, I didn't hear any shouts for help.… Someone said it was silent chaos, and that's a pretty, pretty accurate description," he says. Caudillo called for every ambulance available. But in the chaos before they arrived, he had to make decisions, including trying to assess who needed care and who was already dead. It turned out six people had died and another 13 people were wounded. Other deputies arrived. They began CPR and opened the kits. Each contained $99 worth of gear assembled by David Kleinman, the medic for the sheriff's SWAT team. He got the idea to carry the packs after noticing how many police officers were dying from wounds they got in the line of duty. "It wasn't necessary for them to perish," Kleinman says. "Had there been tools like this they probably would have survived." Kleinman came up with a two-hour training program called "the First Five Minutes." He adapted an I-FAK — an Infantry First Aid Kit — for civilian use. Included in the kit's five items is an emergency bandage he says was originally called an Israeli bandage. The bandage — developed by the Israeli military — looks like an Ace bandage you'd wrap around your knee, with a gauze pad and clips to tighten it. It can be used on any part of the body to cover a wound and stop bleeding; you can even wrap it with a stick and use it as a leg splint. Combat gauze is also in the kit. It's infused with coagulant to stop bleeding. There are shears to cut away clothing. A black nylon tourniquet. And an Asherman chest seal — a bandage that fits over a gunshot or stab wound and has a valve for fluid to escape. Everything in the kit is designed to be used quickly. That's because people with severe wounds can die in the precious minutes before paramedics arrive or before it's safe for them to enter a crime scene or an accident area. Ambulances got to the scene in Tucson in six or seven minutes. But Deputy Caudillo says it felt like forever. "After EMS arrived, I was kind of in shock 'cause it felt like it was so long, and after hearing it was six, seven minutes, it's pretty amazing how that span of time felt so long," he says. Kathy Hiller was the attending emergency room doctor at University Medical Center when victims began arriving. She saw everything in the I-FAK in use and working. She says the items helped stabilize patients. "They looked very effective," she says. "They were applied correctly. They were appropriately used for the injuries that we saw and the patients were actually doing very well with those basic medical interventions." David Kleinman says he knows only of a few law enforcement agencies in Arizona and Texas that use the same, or similar, kits. But now that they've proven their effectiveness in a life-and-death situation, that could change.